Here is another spectacular orchid for the holiday period. Masdevallia is a terrific genus with a diverse range of colours and forms. In contrast to yesterday’s Masdevallia decumana we have the multiflowered and very aptly named Masdevallia superbiens today. 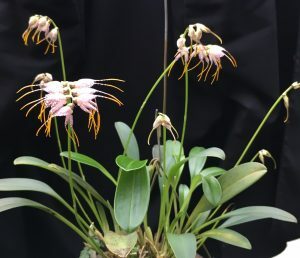 Most Masdevallias produce one flower per stem but some like M. superbiens produce many flowers on each spike. The remarkable flowers of this species with purple spots on a white ground and orange/yellow tails on each sepal make it rather special. The species is native to Ecuador and Bolivia at around 2800m in cool wet forest. We find that plants are happiest in baskets where they are well watered but free draining. 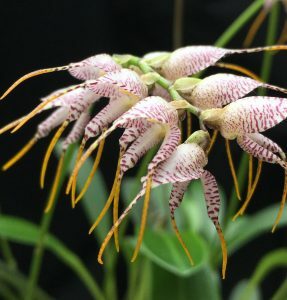 Plants are medium sized for a Masdevallia with broad 12cm leaves and taller spikes that hold the long lasting flowers well clear of the plant. One of our plants is rapidly becoming a specimen and has eight spikes of flowers that will bloom until well into February.